Solar shades installed at California school district | West Coast Solar, Inc. Many schools across the country are still dealing with the effects of the economic downturn, in the form of massive budget cuts that have resulted in teacher layoffs, shortened academic calendars and delayed improvement of aging facilities. Because of this, it is imperative for school systems to consider switching their electrical production to solar power, as the upfront installation costs would be offset in the long run by lower energy bills. The Clovis Unified School District in the Central Valley of California has taken such steps and, by doing so, improved the long-term financial health of the district. Clovis recently had installed 5.9 megawatts (MW) of solar power capacity, which will be used to provide electricity to 18 schools throughout the city. According to PV-Tech, a website that tracks the solar industry, the photovoltaic arrays were installed at 21 different locations and will provide 8.4 kilowatt-hours of electricity every year. They were designed by Cupertino Electric. 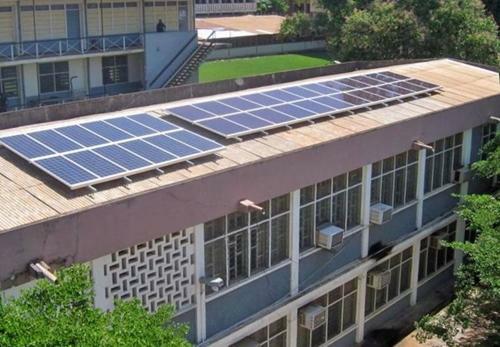 The installation of solar panels also gives educators the opportunity to expose children to clean energy technology, thereby sparking interest in science and engineering. Students will get to see solar energy in action, rather than just reading about in a book or newspaper. The Clovis system provides a living example of the technology to kids who may consider pursuing the subject further in their studies and eventually their careers. On top of all this, it’s expected that solar energy will save the district $2.4 million a year in reduced electricity bills. If you’re interested in finding out how your institution can benefit from solar power, contact West Coast Solar today for more information about Northern California solar energy.